With just two days until my festival debut, I’m feeling excited, organised, nervous and I have been having dreams about it. The dreams have included arriving at the venue without my books; going to the wrong venue; having no attendees (I cried in this one! ), and in a lovely turn of events, in one dream, the event was a resounding success. I’ll have a few nerves on the day, but I’ll keep smiling and remember that it is not going to kill me. This year is Essex Book Festival’s 20th year, which is an outstanding achievement for a grass roots organisation. With just three staff making up the team, it is a wonderful that their vision is fulfilled each year. This must be one oft he longest and most diverse of literature festivals in the UK. Starting on 1 March and running all the way to 31 March, taking in events from Arthur Ransome to Words to the World. The festival is geographically varied too, from east to west and north to south of this large county. The programme of events for children is also extensive, and includes little me! On Saturday 23 March, I will be reading Lum and Lum’s Mum from the Pop-Up Storytelling Armchair in the foyer of Colchester’s Firstsite building. It will be an interactive retelling of Lum’s stories with prizes for everyone who joins in. Come along from 12.30pm, books and cuddly toys will be available to buy too. Later on the same day, at 1.30pm, children can join me in an Imagination & Creation Workshop to create their own stories. Staying with the Festival theme of “Oh, The Places We’ll Go”, children will be encouraged to create a fantastical place and put themselves in the centre of their stories. 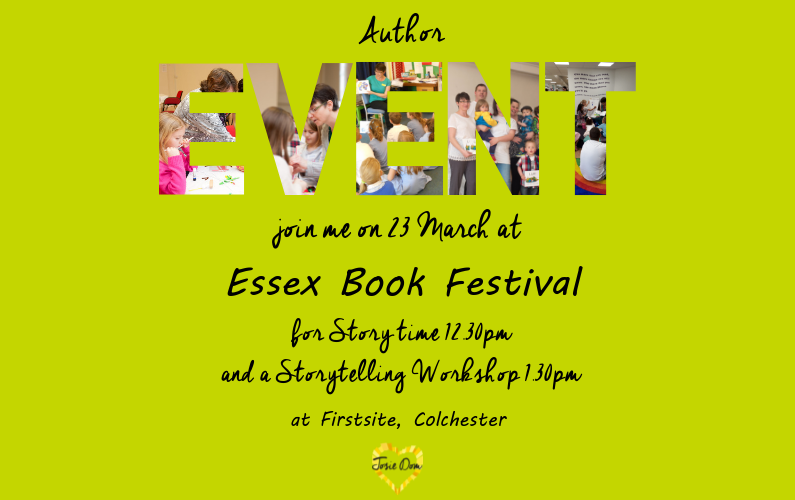 Tickets for the storytelling workshop are just £5 and can be purchased on the Essex Book Festival website. Inspirational story notebooks can be purchased at the event.